Welcome! Here you can get a brief insight into my approach to teaching. 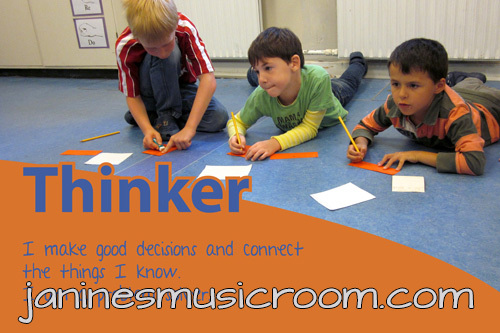 I am a music educator, but I prefer to think of music as the wonderful subject matter through which I help children develop the knowledge, skills, and attitudes they need to be responsible global citizens: critical thinking, personal responsibility, perspective, curiosity, and respect, among many others. I help students develop a commitment to their values and an understanding for other people’s values. I cultivate social and emotional well being through a positive, flexible, open learning environment. 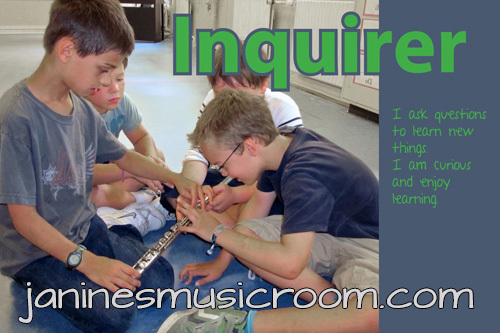 I inspire my students every day to love music and love learning, making meaningful connections to their own experiences and continually inquiring further into what interests them. I have posters like these in my classroom (one for each IB Learner Profile attribute, featuring my own students) to remind the children—and myself—what is at the center of our education. In my classroom, we learn through inquiry, collaboration, and reflection. We learn through play, and we learn by doing (creating, performing, moving, discussing, analyzing). I am not a lecturer but a guide who helps students with their discoveries, learning alongside them. All students can be successful learners in my classroom, developing their skills and understanding at the rate, and in the way, that best suits their needs. My classroom has a positive, encouraging atmosphere. I have high expectations of my students, and they should have high expectations of me. Fairness and consistency in a mutually respectful environment allow us to have a classroom dynamic that supports flexibility and transparency in our learning, where students are involved in their goals and assessments, and they have the freedom to take responsibility for their learning. We are looking for a music teacher to hold an incurison with the children at our centre. I heard great things about your classes and was wanting some information about the cost, time and age groups please.